I'm planning on doing a solo 6 stage Grand Tour next week, starting on Monday and playing 1 or 2 stages each evening. But I could use some help planning the details, especially since I see a lot of minor rule variations on the boards here. • I want to do 6 stages in total but haven't decided which, yet. • Cyclists who have past the finish line can't slipstream (but you can cross the finish line by slipstreaming). • Has anyone done something similar? Will the ruleset I intent on using lead to interesting games? Bet you'll run out of those cards after a couple of stages. You just can't spent them as fast as you gain them. My solo Tours have always been that I start with ~3 exhaustion between my 2 cyclists at the start and don't lose any between stages. Since the bots aren't taking any, if you get all 60 exhaustion in your decks, that's an auto-lose. It's Tour Over dude! Playing a really long Tour, like 19 stages, I've considered including a couple "rest days" where I do get to lose half, but that's more to have something to look forward to mid-Tour than that I was going to run out of cards. Bram, that all looks good. • What is a balanced and interesting combination of stages? I can't give specific track recommendations, but I would focus on hilly stages with 1-3 medium hills (~6-7 ascent spaces each). I like to include one stage with 1-2 big mountains (10+ ascent spaces) and I also like plateaus (long flat after an ascent before next descent). Mountain finishes are fun too but can feel anticlimactic; they can kill sprinter muscle bots. I like to leave an all-flat stage for last, sometimes I even make it short (~50 spaces). That's too bad you don't have access to the app. It's really helpful to figure out the time gaps/bonuses for you. I don't use it for tracks. I would also suggest a good mix of flat, hilly and possibly an extreme Mountain stage (probably of a 50 step length). There are loads of good stages out there without the App. If you look at the files section the - "Unofficial Expansion set : custom stages, variants" file will give you a large number of good stages to try out. I think your rule set should be fine. Wow, 19 stages. That's quite the Grand tour. But it's good to know that the exhaustion rules should provide no problem. Thanks for the pointers, I'll also check out the file section for interesting stages. So I played the first 2 stages (Ronde van Wevelgem & Stage 9) today. Finished 1st(R) & 2nd(S) in the first stage and 2nd(S) & 3rd(R) in the second stage. I'm not sure how I feel about a whole group of connected cyclists scoring the same time. I feels like the Pink Rouleur's finishing time is unfairly bad after the first race. For my spreadsheet with the current standings look here. Actually, I realized I'm not sure how they do it in real cycling - is the finishing time gap between two packs based on starting a stop watch when the front cyclist of the first pack crosses the line, or when the rear cyclist of the first pack crosses line? I'm pretty sure during a race, the estimated time gaps are calculated for example from the rear of a breakaway group and the front of the peloton. Maybe it makes more sense in FR to calculate a pack's time based on the location of the rear cyclist. But the turn-based nature of the game still causes inherent problems. Realistically, the Pink Rouleur should have the same time finishing time as the rest of the pack. If at the end of turn I have a drawn-out string of all 8 cyclists, with 5 finishers occupying the 5 spaces past the line, and 3 yet-to-cross occupying the 3 spaces before the line, with no gaps obviously because of slipstreaming, maybe they should all get the same time based on how far those 3 yet-to-cross cyclists get past the line next turn? On mountain finishes, I like to rule that connected cyclists DON'T get the same time. Each cyclist is timed individually based on their space. As far as I know, the real Grand Tour rules for packs crossing at the same time, is that all riders in the pack get the time of the frontmost rider. The rules for whether or not it was considered the "same" pack, were once (but I believe they might have changed slightly) that as long as the rear wheel of the winning cyclist wasn't further than the front wheel of the next rider, then both these riders were in the same pack. Then the second riders rear wheel would count, and so on and on. In other words, it would be possible for every single rider to get the same time as the winner. However, if there was just a single gap where no wheels would overlap, then the next rider would count as the leader of the following pack, and ALL riders coming in with him, would get the same time. Now imagine 160 riders crossing, and 140 of them getting in on the first pack. The last 20 could end up losing substantial time, and at least the time it would take 140 riders to cross. Those numbers were not picked at random, they represent the exact distribution in the picture above This could in principle be as small a gap as 20cm. And it could cost a lot of time. Now I DO understand that when you look at the above picture, then the intuitive reaction is exactly what both of you had. It seems unfair. However the cycling rules do allow for very minor differences, still resulting in large gaps in time. 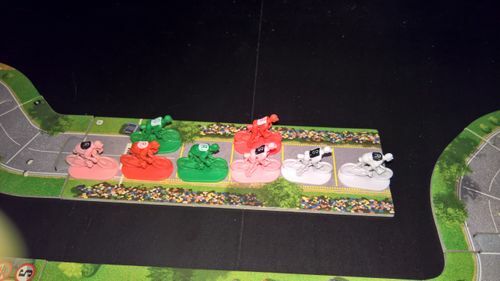 This is what is represented in the Grand Tour rules for Flamme Rouge, and though it isn't perfect, I do believe there are solid arguments for it. I hope this makes sense, and that I am not rambling too much! I'm almost sure in real cycling, whether 2 cyclists get the same time is not/no longer based on rear-front wheels overlapping. I think it's basically if there's less than a 1 second difference, they get the same time. Now I have to watch a race and see if a rider dropped a little bit from a massive peloton gets a big time gap or not. It's definitely one second for the Tour De France. The change from "overlapped wheels" to "allowed gaps" is for reasons of safety - the peleton doesn't have to actively pack so vigorously as it crosses the line to avoid catastrophic unexpected time losses, so avoiding massive crashes in a group of people who weren't winning anyway. I think the Flamme Rouge version of same time works for either case.